When a reputable school of medicine is validating what many of us already know – that Americans are over-prescribed and over-charged for unnecessary medical tests and prescriptions drugs – it’s a big deal. Researchers at Mount Sinai School of Medicine found $6.7 billion was spent in one year for unnecessary tests or prescribing unnecessary medications, with 86% of that cost attributed to the prescription of brand-name statins to treat high cholesterol. Prevention and healthy living can be accomplished naturally with a little effort. Take the example of statins drugs that comprised 86% of the unnecessary medications prescribed (at an astonishing $6.7 billion price tag!). Many Let’s Talk Health members have been incorporating Cardio Advantage Plus – our revolutionary heart support formula – for years in their daily supplementation regimen either separately or as part of the Golden Healthy Life Protocol. Recently we have had real Let’s Talk Health members write in with their experience using Cardio Advantage Plus. “My hubby went through chelation therapy to help his circulation. He had no pulse in his one ankle and started getting sores on that foot. Our family doctor said if he didn’t do something (chelation) he would lose the foot and then probably the leg eventually. We had a neighbor who went through this so we were convinced that the chelation was worth a try. He went through 30 sessions and I started giving him Cardio Advantage Plus because he did not want to do the follow up chelations. Remember… there are natural ways to address the many health issues facing Americans today. 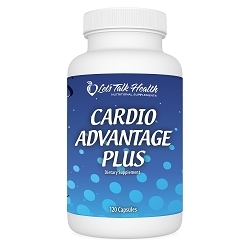 Cardio Advantage Plus is a great natural support for the heart and many of our other proprietary ‘formulas with a purpose’ will help support your body in addressing many of the other health related issues plaguing our society today.